Just use the global structure "OS" and the usual location names to access the variables. 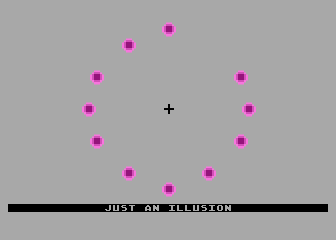 To 'watch' this demo just focus the cross in the middle and watch how a non-existing greenish dot appears and pink dots seem to vanish. (The effect is quite popular and was already used in the demo "Optical" (http://a8.fandal.cz/...p?files_id=6624)). Edited by Irgendwer, Tue Mar 12, 2019 3:35 PM. Thanks irgendwer, any difference in performance ? Also where can I find reference to the things I can use with the OS prefix? No, access by structure is as fast as direct peek/poke or load/store from/to the address in assembler. In general all OS locations up to page 6 are available now. The names are the usual ones you find in the system reference manual/OS source code. In "Mapping the Atari" they are a little bit scattered, so in "De Re Atari" or "Atari System Reference Manual". Edited by Irgendwer, Tue Mar 19, 2019 2:16 PM. are you part of the CC65 developers? or just a really good high end user? Edited by Irgendwer, Wed Mar 20, 2019 1:43 PM. where Windows users can find also a "Windows Snapshot" containing binaries.